This is one sequel it's a pleasure to review. Although not as fresh and lively as the first Paddington, the second feature based on the popular children's book series by Michael Bond offers some of the best family entertainment outside an animated feature. Indeed, the film's essential heart and spirit are those of an animated film. Everything from the story to the set design and computer-generated title character would be at home without the live-action envelope that contains them. 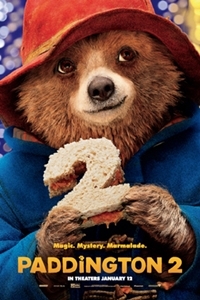 Paddington 2 exhibits its bona fides as a film for all ages with subtle nods to Modern Times (a Chaplin-esque mustache), The Untouchables (a line about bringing a knife to a gunfight), and the overproduced musicals of the '30s (Busby Berkeley would have been proud) alongside the more obvious kid-friendly elements. A who's-who of British thespians not seen since the Harry Potter movies have turned out to help Paddington (whose voice is again provided by Q's Ben Whishaw) on his second adventure. Returning are Sally Hawkins and Hugh Bonneville as Paddington's adopted parents, Mary and Henry Brown; Julie Walters as Mrs. Bird, the housekeeper; and Jim Broadbent as Mr. Gruber. Smaller roles and cameos go to Peter Capaldi (as the officious Mr. Curry), Michael Gambon (voice work as Uncle Pastuzo), and Imelda Staunton (voice work as Aunt Lucy). Newcomers include Hugh Grant as the conniving Phoenix Buchanan and Brendan Gleeson as the not-as-bad-as-he-looks Knuckles McGinty. The movie gets off to a lighthearted start, re-introducing us to Paddington and his uber-clean, uber-colorful, uber-friendly London several years after the 2014 adventure ended. With his Aunt Lucy approaching her 100th birthday, Paddington is in search of the perfect present. He finds it in a pop-up book being sold by antiques dealer Mr. Gruber. To earn the money, Paddington tries out several odd jobs. His short stint working at a barbershop is marred by a slapstick comedy routine worthy of Buster Keaton. Things don't start much better when he tries his hand at window-washing. Meanwhile, when preening actor Phoenix Buchanan learns about the existence of the pop-up book, which he wants for different reasons than Paddington, he embarks on a nefarious scheme to steal it and frame the innocent bear. This results in a prison stint where Paddington's misfortunes are turned to assets with a little help from a marmalade sandwich. Paddington 2 is almost too delightful to poke holes in; watching it with the same mindset one reserves for animated fare is the best way to enjoy it. Like Nicole Kidman in Paddington, Hugh Grant shakes off any vestiges of serious acting and starts munching on the scenery from his first scene. Like his rakish character in the Bridget Jones movies, he slathers on the charm as a means to camouflage a warped interior but he's always a little too fatuous to be alarming as a bad guy. Paddington 2 occasionally strums on the heartstrings - mainly in scenes that relate to the importance of family and community - but never too loudly or for too long. The production is mainly content to generate a sense of well-being and, on those occasions when things get a little dark, there's always a laugh waiting to lighten the mood. The special effects, although not blockbuster-spectacular, are good enough. The bears are rendered believably and the few animated sequences are lively and colorful. I was especially enamored of the scene in which Paddington and Aunt Lucy stroll around through the pages of the pop-up book. This isn't cutting-edge material but it's more inventive than the most elegant, elaborate set-piece Pixar has released in at least the last half-dozen years. Paddington 2 is a charming early-year offering and, although the main character is better known in the U.K. than the U.S., no cultural leap is required to fall in love with the bear and enjoy his adventures. As intended, the movie will enthrall children while providing enough sophisticated tidbits to keep adults engaged. The final cut has been dedicated to author Michael Bond, Paddington's creator, who died last year at the age of 91. His legacy will live on in the hearts and minds of children of all ages (not to mention in another movie, which has already been greenlighted).